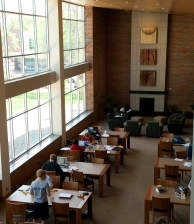 The Augustana Library Associates, the annual giving program of the Mikkelsen Library, is composed of dedicated and committed supporters who provide unrestricted annual support for the library. As the heart of Augustana’s academic community, the Mikkelsen Library needs the critical support of the Library Associates, which helps to expand collections and services, as well as provide opportunities for cultural events. We accept gifts and pledge payments for the Library Associates online. Please visit the Library Associates page for more information.